Squint (strabismus) is a condition in which someone's eyes are not aligned correctly – when one eye is looking straight, the other eye is looking in a different direction. Their eyes may be straight at times, and turned at others, or they could be turning constantly. About 4% of children have a squint. If someone suddenly develops a squint, it's important to see a GP or eye health professional as soon as possible, as it can be a sign of some serious conditions. There are four types of squint: esotropia, exotropia, hypertropia, hypotropia. The illustration shows what they all look like. There are many types of squint, with many causes. It can run in families and occasionally can be caused by serious eye or nerve (neurological) diseases. A squint can happen at any age, and is closely linked to having unequal vision (amblyopia) and focusing problems or poor vision. If you think your child may have squint, get them assessed by an orthoptist (a health professional who specialises in eye movement disorders) or ophthalmologist (specialist eye doctor). Your child is never too young to have an eye examination or start treatment, even if they are a baby. If your baby has a significant squint when they are 3 months old, they won't grow out of it. The sooner they get treatment, the better the result will be. 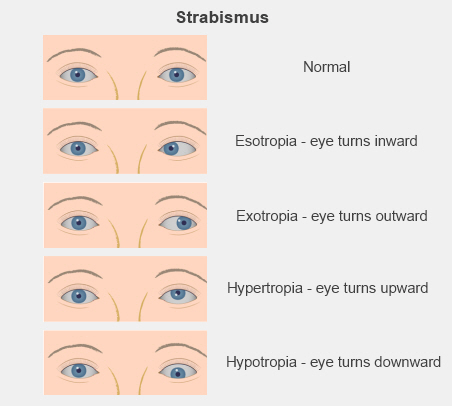 Strabismus can cause four types of problems. If left untreated, a child's eye can become lazy. This can lead to permanent poor sight in that eye. When your child has a squint, their two eyes do not work together. Their brain will ignore the turning eye, so they won't be able to judge distance as well as other people (poor depth perception). Occasionally a child can experience double vision. Some cosmetic squints can lead to social issues. Other children find the squint distracting, which can make it difficult to communicate well. There are four common ways that childhood strabismus is treated. Glasses are prescribed to correct a focusing problem. Your child is given a full eye examination using eye drops to dilate both pupils. This makes sure they get a correct prescription. Glasses may completely or partially correct an eye turn. Your child may need surgery to reposition the muscles on their eyeball if their eye needs to be straightened. If your child has lazy eye, this will have to be treated before they can have surgery. Surgery is not an alternative to wearing glasses, but is often used with prescribed glasses for the best treatment. If surgery is an option, your ophthalmologist will talk to you about this and explain the procedure. No two children's eyes are alike, which means treatment for one child is very different to the next. Do not compare your child's eyes to others. Your child will need regular check-ups with their eye doctor, either in a public hospital or a private clinic, after treatment to keep track of their progress. If you need help to pay for your child's glasses you may be eligible for the children's glasses subsidy. Talk to your optometrist for referral advice and options. General information for parents and caregivers, including signs to look out for that may indicate your child has a vision problem. HealthPathways Canterbury, Children's Eye Problems, accessed May 2016.